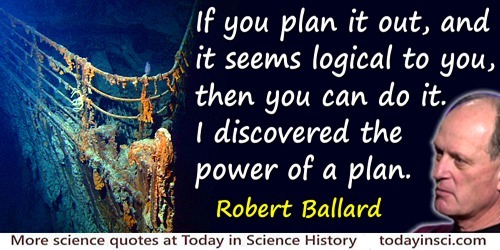 American oceanographer and explorer who explored the deep-sea wreck of Titanic. He discovered the first deep-sea thermal vents and investigated the unique marine life around black smokers. If you plan it out, and it seems logical to you, then you can do it. I discovered the power of a plan. Quoted in biography on website of the National Geographic Channel, Australia. 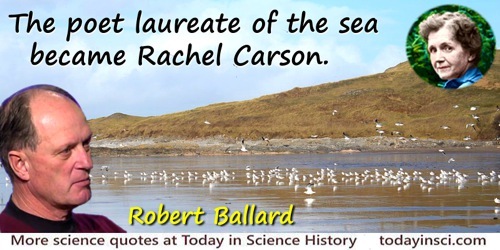 The poet laureate of the sea became Rachel Carson. From Introduction to Rachel Carson, The Sea Around Us (2003 edition), xviii. The original edition was published 1950. 30 Jun - short biography, births, deaths and events on date of Ballard's birth.